For our regular feature Collection Rotation, we invite a guest to organize a digital exhibition from our collection works online. Today, please welcome musician and archivist Madalyn Merkey. This conceived collection examines aspects of shifting cultural situations, as well as artists whose work challenges the institutional inclination to group artworks according to medium; it is rooted in large-scale environmental and performance works. My desire with this exhibition is to experience a revolutionary art form capable of addressing contemporary social and political concerns. I’ve repurposed ten artworks from different disciplines as active elements within an ecosystem, investigating constructs or constraints of the gallery that hamper or assist in the cultivation of multiple discourses. room 1: desire for physical essence. On the floor in the center of the room lies a catwalk of six evenly spaced glass funnels. 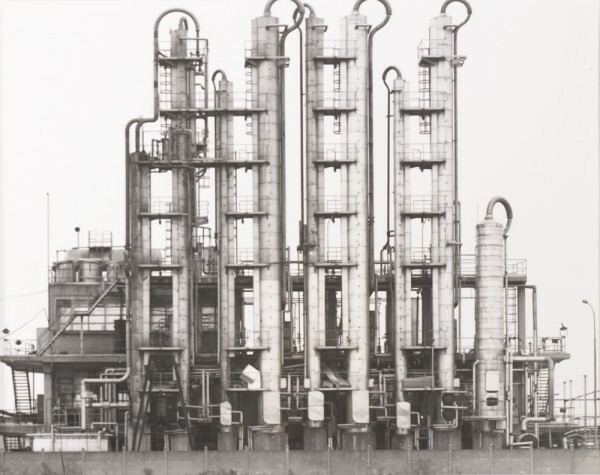 Partitioned by a pair of black shoes, the funnels contain ground coal and mercury. Suspended overhead are fourteen copper rods controlled by electronic motors. 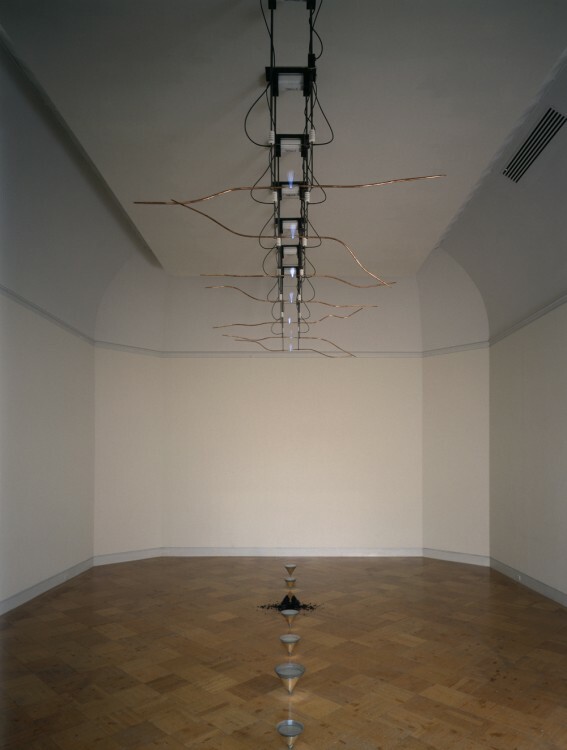 The Hydra-Forest: Performing Oscar Wilde by Rebecca Horn thus serves as an overture to the exhibition. 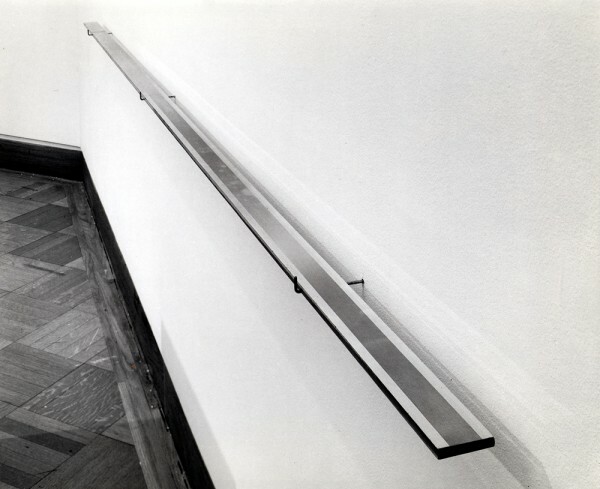 Paralleling the right side of Horn’s sculpture is Larry Bell’s Untitled, a long, thin strip of glass coated with a vaporized metallic compound. The compound materials of Auguste Rodin’s Le Baiser (The Kiss) provide a counterpoint to the pure elements in Horn’s work. 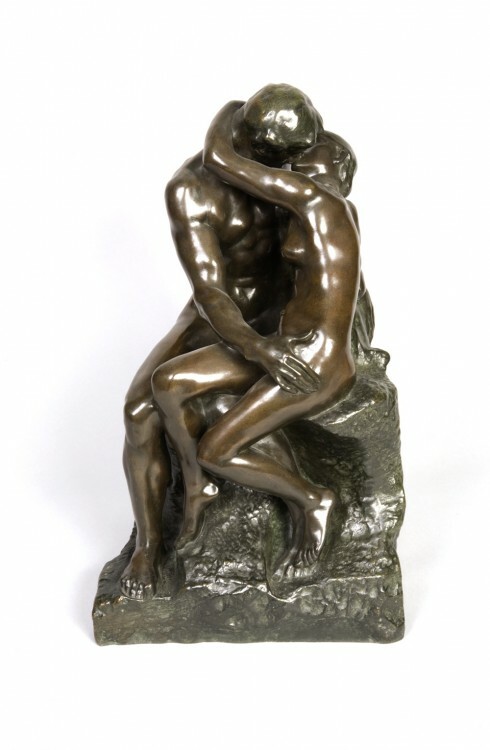 It depicts in bronze an embrace between two figures swept away in passion. room 2: communication by environment, art, and viewer. This room facilitates an active exchange between two works in order to generate new meaning. 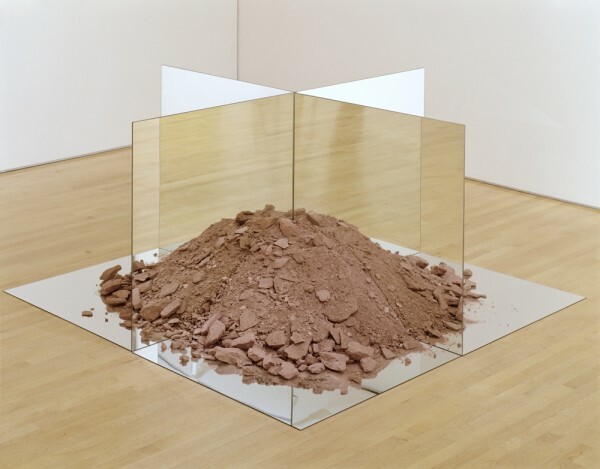 Nonsite by Robert Smithson features soil from the German city of Essen situated amidst twelve geometrically arranged mirrors. 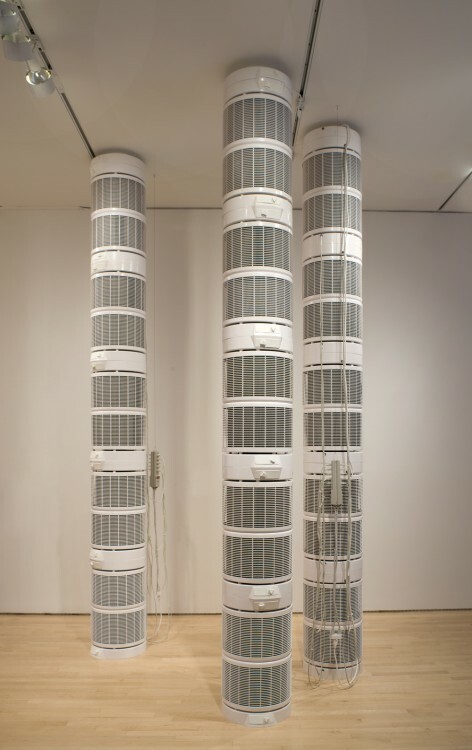 Across the room, An Te Liu’s Exchange monitors the air quality of the gallery in real time via ten vertically stacked high-particulate air purifiers. One can imagine Exchange lifting the noise floor of the room while stirring up and taking in the smallest particles of Essen and patrons alike. room 3: art beyond aesthetics. 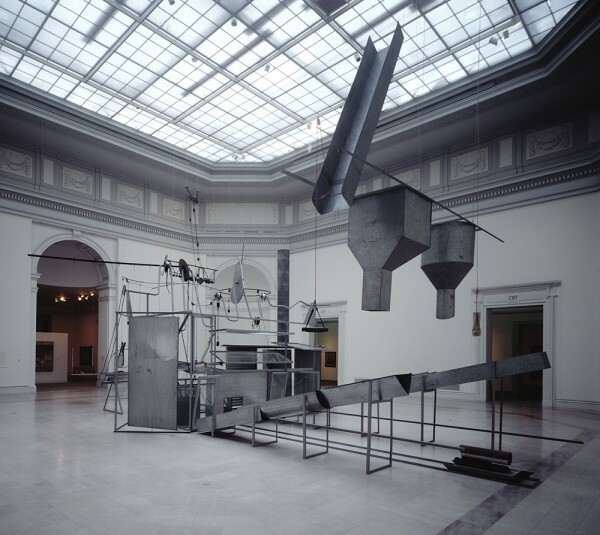 This room contains work by Hans Haacke and Ann Hamilton. Each artist works within a system, implicating viewers in a wider social context. 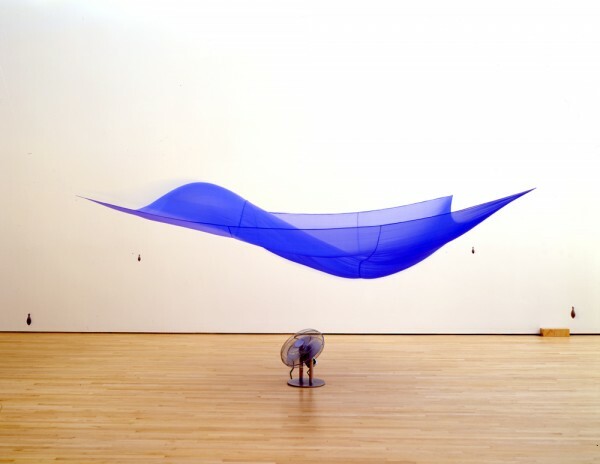 Haacke’s Blue Sail features a single unsettling chiffon cloth suspended above an oscillating fan. 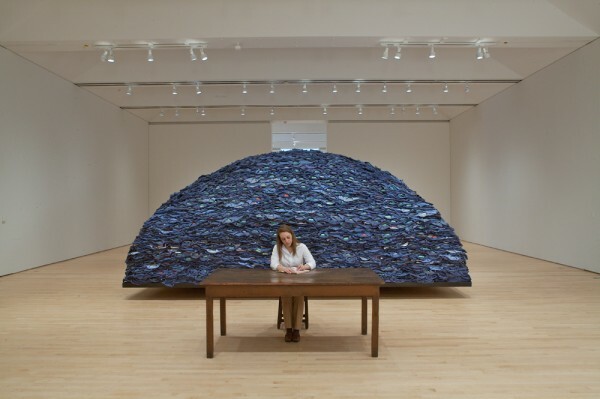 Hamilton’s indigo blue responds to the labor history of Charleston, South Carolina, with a pile of 48,000 articles of denim. Each garment, individually folded and laid, presents an anonymous trace of labor, evoking a system of organized distribution from the completed structure. Blue Sail functions as a state of pure enunciation, extremely simple in relating the physical properties of material into a dialog with respect to elaborate structures. If the previous room suggests artists conducting research from within systems, then this room suggests methods achieved by artists taking a vantage point outside of a system. Observers — corporeal, considering — immersed by the surrounding landscape, remain apart. 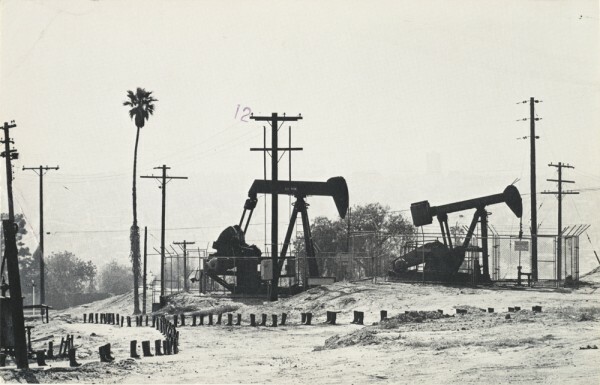 Two very small photos adorn the far wall: one by Eleanor Antin and one by Bernd and Hilla Becher. Each of the two images belong to larger series, sharing oil as subject matter. Across the room, Dennis Oppenheim’s Final Stroke-Project for a Glass Factory is an enormous, wavering steel structure. How Final Stroke-Project physically functions is unknown to me, but the appeal of this work came from its gasoline-powered heaters. A small smell of gas or spare operational motor would convey missing olfactory information for the final room. When I see art, I want to investigate the space and make as many observations as time allows, to revisit multiple times, on different days, in light of new participants and situations. I am looking for a language or truth, for artworks to speak with one another even when no one else is present. To enter the nose as one exits the last gallery is for me unexpectedly thrilling — to be fully open with one’s senses and engage in the present experience. To float with new energy back into space. Madalyn Merkey is a California-based composer working in computer music. Her interests include managing archives and sound studios in connection to acoustic research.